Why do people applaud plane landings? Why Do People Applaud When Planes Land? Actually, they don’t. But imagine how annoying it would be if they did. So who are these airborne clappers, and what makes them clap like airborne seals? When did the practice start, what’s it for, and will it ever go away? I spent some time cruising online forums in search of answers to these questions. But the more I learned about the history of airplane applause and the history of sneering at the same, the more I came to doubt the premise of my hunt. The phenomenon itself may be exaggerated in the minds of those who mock it. Indeed, I now suspect there are very few cabin clappers in the wild and that a pilot’s unearned bravos and bravas are not so much a scourge that ought to be curtailed as a curmudgeon’s fantasy of something that would in fact be quite annoying if it really happened on the regular. I mean to say that my pet peeve, and Handler’s, is more or less ginned up. It’s not that no one ever celebrates the final moment of flight. (You can find plenty of examples of the cabin clap on YouTube.) But these are freak events. An airplane’s landing cheer exists, but it rarely gets deployed. When it does it’s often for a special reason—a touchdown in a heavy storm, perhaps, or under some other form of flight duress. This is not the cabin clap we mean when we call the clapper silly or suspicious, though. No, we’re referring to a different, maybe apocryphal variety: the applause that has no rationale—a knee-jerk cheer for a plane’s routine arrival. This latter version of the landing clap, dopey and unearned, has long been made the object of ridicule, if not nativist derision. Indeed, an early piece about the practice by a travel writer, published by the New York Times in 1997, claims we caught the clap from foreigners: Cheering for a touchdown is a “common yet enigmatic phenomenon of modern air travel,” the author writes, though one that’s seldom heard on domestic routes. Clappers aren’t from America, he says; they’re passengers from overseas, “returning to their native soil,” and the loudest perpetrators are those who happen to possess a high degree of “cultural passion.” The Spaniards, for example, are vibrant landing-clappers; so are the Brazilians and airplane passengers from Italy. Then again, the piece also adds that “even the famously unemotional Japanese engage in the Landing Clap;” along with all the patriotic Russians and Germans who have journeyed back to their motherlands. These stereotypes can’t all be true, of course. The round-robin claims should make us more suspicious: If Germans really clap for landing, and so do Russians, Asians, Israelis, Jamaicans, Dominicans, Filipinos, Canadians, and Americans, well then applause would be more or less ubiquitous on commercial flights, which it’s clearly not. 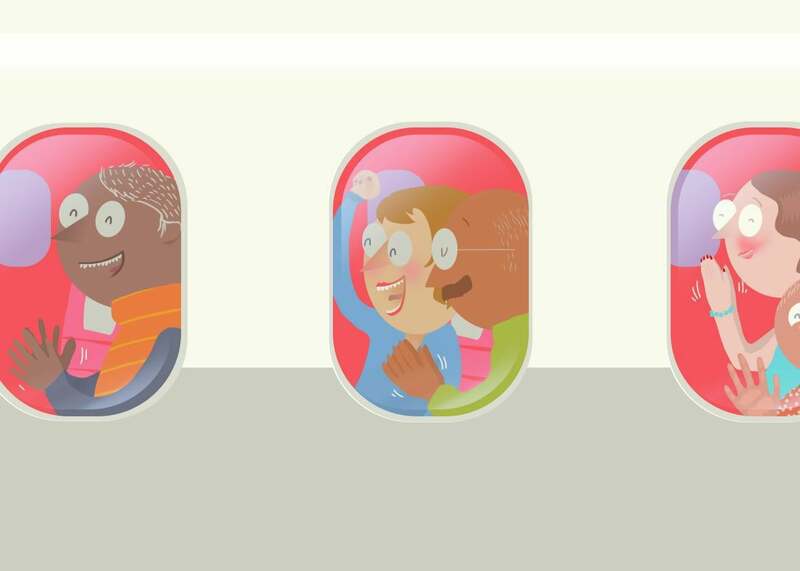 Yet everyone who believes in landing claps—and finds them quaint, silly, or suspicious—seems inclined to pin the custom on the passengers of another, less sophisticated culture. We don’t cheer at airplane landings. They do. In a slight variation on this theme, some will claim that landing-clappers aren’t from another country; they’re from another time. We used to cheer on landing, this theory goes, back when people weren’t quite so used to flying, and when flying wasn’t quite so safe. Now, in recent years, this custom has subsided. We’ve gotten savvier and less easily impressed. “In my experience, clapping on landing was way more common a few years ago,” wrote one user in a long debate on Airliners.net. “In the past 25 years, I find that it happens less and less,” another said. Certainly in the age of modern aviation, those accounts of landing cheers that do exist tend to link them to some specific cause or calamity. In 1991, for example, an Alaska Airlines passenger demanded to be let off the plane before it took off because he’d learned a woman would be at the flight’s controls. Newspapers made a point of saying the remaining passengers applauded for the pilot when she later landed smoothly in Seattle. Landing claps were also noted in January of 2000, on flights that landed safely in the wee hours of New Year’s Day: Passengers were glad for having survived the Y2K computer bug. The following autumn, for a brief spell in the aftermath of 9/11, news reports observed that passengers were cheering “boring flights” with safe arrivals. The most common form of landing cheer has always been the one that celebrates avoidance of catastrophe. It’s for captains who have earned their plaudits facing up, Sully-esque, to some dire airplane hazard. Consider Southwest Airlines Flight 812, in April 2011: A hole tore though the cabin roof, flight attendants passed out from lack of oxygen, and the cockpit crew lost access to its main controls. People clapped when that plane touched down and then began to hug one another. “It was unreal,” one told the Associated Press. “Everybody was [acting] like they were high school chums.” Or what about the American Airlines flight from 2009 that touched down one Sunday night in Charlotte, North Carolina, in a very heavy fog, before veering off the runway and scraping a wing against the ground. Miraculously, no passengers were injured. When the tumult stopped, people cheered in gratitude and relief. But they themselves bring to mind another question. Unless you’ve flown a plane yourself, and understand the tribulations of a tricky landing, then how are you supposed to know when a bumpy touchdown means your pilot has excelled, or when it means the opposite? Who are you to judge her skill, let alone applaud it? Take that Charlotte flight, for example. A subsequent investigation found the cockpit crew had known the plane was off its course yet refused to take a second pass. According to the Wall Street Journal, the pilots chose instead—mistakenly—to take their autopilot offline. “Crew fatigue might have been an issue,” the paper noted. If that’s the case, the passengers may have clapped in celebration of their crew’s incompetence. It did not take long for the passengers to realize that their clap was premature. The plane came down too fast, barreled off the runway and rolled into a ravine, where it burst into flames. It looked like the left engine had exploded. Smoke filled the cabin. “The light became very, very yellow by the fire’s flame,” the passenger continued, “and we said that were all going to die at that moment, and the airplane continued to roll.” No one died, but some among the passengers who had moments earlier been clapping for the pilot came away with serious injuries. A few years later a class-action suit against the airline would be settled for $10 million, after investigators found that the pilots had missed important signals and failed to “make the standard callouts” for the situation. Maybe that’s the hidden problem with the landing clap: Even when we think applause is well-deserved, we may be off the mark.